On the wall of Liu Ming's office hangs a map thickly dotted with small flags to show the drum maker's sales network across the world. As the founder of Jinbao, a Tianjin-based musical instrument enterprise with over 1,800 workers, Liu has sold his products to more than 90 countries and regions. "But we had a tough time at first," the 74-year-old Liu said. China's private businesses have witnessed booming growth thanks to the country's reform and opening up during the past decades. Liu's business started in 1984 when he rented several shabby houses and hired a dozen workers to cast molds. Once on his way to deliver screws to a musical instrument factory in Beijing, he happened to see the workers were studying an imported snare drum. At that time, few Chinese companies were able to manufacture snare drums. "Can I have a try?" Liu asked the factory owner. The factory owner allowed Liu to bring the drum home. Thanks to his background in mechanical engineering, his drum design was highly recognized by the factory, and he obtained his first order one week later. Drums produced by Jinbao made their public debut at a musical instrument exhibition in Tianjin the same year, but they were ignored by exhibitors and visitors. Liu was torn with anxiety. He jumped on a drum and shouted, "I can't believe no one pays attention to such good drums." To his surprise, his dramatic behavior drew a crowd of merchants. However, he suffered a setback on his first overseas endeavor selling drums. In 1997, he and his colleagues brought a set of drums to a musical instrument exhibition held in Germany. Failing to speak any foreign languages, they took a dictionary and communicated with foreign exhibitors through body language. At the exhibition, Liu noticed a huge gap between their products and the others on display. He wanted to sell a drum set for about 100 to 200 U.S. dollars to a foreign visitor before the end of the exhibition; however, the customer rejected him and proposed to help Liu throw the drum into a trashcan for free. "At that time, I made up my mind to establish a strong brand with standards and high-quality drums," Liu said. He started reforming his company by introducing more advanced production lines and improving management. Today, an electronic screen in Jinbao's workshop displays the real-time data of each production line. Machines are running at high speed with just a few employees monitoring the operations. "We have 12 workers and over 60 machines in our workshop," said Wu Dingjun, a worker at one of the four Jinbao plants where they produce more than 1,000 drum sets each day. 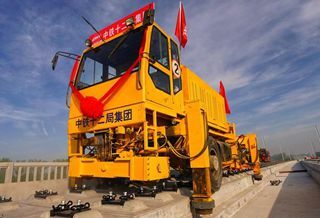 Now Jinbao has turned into a company with assets of more than 600 million yuan (around 88 million U.S. dollars). It produces over 400 kinds of products including drums and wind instruments. Sixty percent of them are sold in overseas markets. Each year, Jinbao invests over 10 million yuan on research and development and has been awarded more than 400 patents. "With so many foreign merchants willing to talk to us when we appear at international exhibitions, they now have to make appointments in advance," Liu said. Private businesses have emerged as a vibrant force in national economic and social development, currently providing more than 60 percent of China's GDP, 60 percent of the fixed-asset investment, 75 percent of technological innovation and 90 percent of new urban jobs. Jin Jiguang, president of the Percussion Institute affiliated with the Chinese Musicians' Association, said a growing number of Chinese musical instrument companies have developed awareness of seeking innovation and making cutting-edge designs so as to better meet international demands. China's big market potential for musical instruments has also supported the industry's development. The country has become the world's second-largest musical instrument market. Last year, the value of the market reached 44.8 billion yuan, accounting for about one-third of the world's total and coming in second only after the United States, according to the Music China 2018 expo. There are both opportunities and challenges. "We will keep learning and improving ourselves. Innovation is always key to enhancing the competitiveness of our products," Liu said.